I really, really want to write more about the Bedlam game, but all the BCS bluster this week just fascinates me. 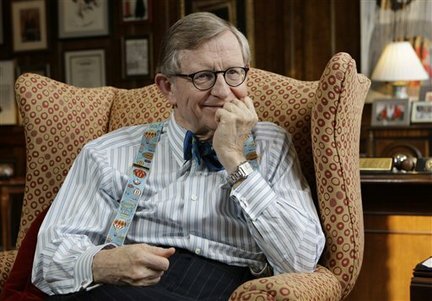 For the uninformed, E. Gordon Gee, the bow-tied president of The Ohio State University, fired the latest salvo in the passive aggressive war between college football haves and have-nots Wednesday when he said so-called non-AQ teams like Boise State and TCU don't deserve to play for the national championship. The line that will be forever etched in the public's mind when they look back on Gee Whiz's greatest contribution to the BCS Era: "I do know, having been both a Southeastern Conference president and a Big Ten president, that it's like murderer's row every week for these schools. We do not play the Little Sisters of the Poor." Nothing like a whitebread, country-clubbing, old fogy bitching about the riff-raff to drive a stake into the heart of your cause in the court of public opinion. That image truly represents death to the BCS. Anyway, as clumsy as Gee's delivery may have been, his crotchety complaints get at the heart of college football's seemingly irreconcilable debate over strength of schedule. Well, if it's more big games the Broncos need to bolster the resume, I know exactly who has the juice to make that happen. For the past few years, early-season games at neutral sites have been all the rage in scheduling. Boise, itself, is no stranger, having played Virginia Tech this year at Daniel Snyder Stadium on Labor Day. The Worldwide Leader has been driving the bus on these non-conference tilts, offering lucrative paydays to convince high-profile squads to give up home dates with cupcakes to start the year off with a bang. If teams like Boise and TCU are having that much trouble scheduling games with worthy opponents, why not partner with ESPN and let it do the heavy lifting? Approach the network to schedule a nationwide barnstorming tour of made-for-TV matchups with big-name teams. For example, start the season with a game on Labor Day weekend in Charlotte against Clemson. Take a week off, play a home conference game, and then travel to Kansas City to take on Oklahoma at Arrowhead Stadium. Finish the out-of-conference slate a few weeks later in Los Angeles versus Oregon. Is it an ambitious plan? Yes. Would fans be upset about giving up some home games? For sure. But it would presumably remove all doubt about championship "worthiness" and do so on ESPN's dime.